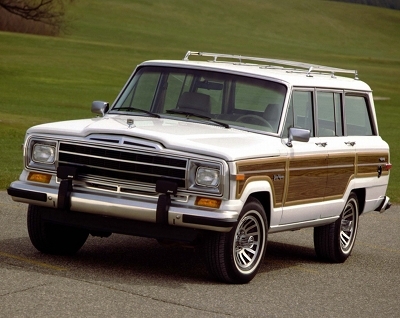 Old Car Memories > Commentary > Jeep to Produce New Grand Wagoneer? There’s no classic SUV more sought after than the Jeep Grand Wagoneer. Though the Wagoneer made it’s first debut for the 1963 model year, it didn’t come into its own until it became the Grand Wagoneer for the 1984 model year. The name change only occurred since a smaller XJ platform Wagoneer model was released for 1984. The Jeep SJ platform Wagoneer and Grand Wagoneer had a combined production span of three decades. Its overall body styling never changed during this period, only gradual front-end, rear, and other trim changes occurred over this long production span. The Grand Wagoneer had its last update for the 1986 model year. This last revision would last 5 model years. 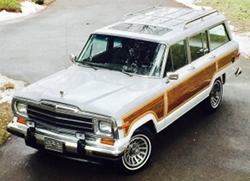 1991 would be the Grand Wagoneer’s last model year on the SJ platform. Jeep released an all new ZJ based Grand Wagoneer for 1993 to placate traditional Grand Wagoneer buyers. It was essentially a top-of-the-line Jeep Grand Cherokee with simulated wood grain panels. Grand Wagoneer purists didn’t embrace it, and ZJ Grand Wagoneer production ended when the 1993 model year came to a close. Currently in 2017, mint condition low mileage 1986-1991 Grand Wagoneers are selling for prices as high as little over $50,000. These Grand Wagoneers have become the hottest SUVs among collectors. The popularity of the classic Grand Wagoneer apparently hasn’t gone unnoticed by Jeep and for the last decade it has been tantalizing SUV buyers with talk of the return of the Grand Wagoneer and/or Wagoneer. After much teasing Jeep had finally decided to produce a 2019 Wagoneer and Grand Wagoneer based on a stretched version of the upcoming all-new 2019 Jeep Grand Cherokee platform. This platform will be a state-of-the-art uni-body platform. Sergio Marchionne president of Fiat Chrysler Automobiles (FCA) had mentioned he wanted to produce a Jeep model that would compete directly with the ultra luxury high price Range Rover. The Grand Wagoneer was just the model to make Marchionne’s dream, a reality. It was planned to be an ultra luxury SUV that would be higher up the price scale than the Grand Cherokee Summit which is currently Jeep’s flagship luxury SUV model. Jeep had planned for the Grand Wagoneer to be Jeep’s new flagship luxury SUV and the Wagoneer to be a luxury SUV that would be higher in the price range than the Summit but below the Grand Wagoneer. During a 2016 dealer meeting, Jeep showcased a poster showing the size and overall design of the upcoming Grand Wagoneer compared to other current and future Jeep offerings. The Grand Wagoneer as shown in the poster was wider and taller than the current Grand Cherokee. Unfortunately like some good plans, FCA suddenly pulled the rug out from under Jeep in December 2016 with the announcement that production of the upcoming Wagoneer and Grand Wagoneer had been cancelled. In January 2017 the game of ping pong started over again, FCA announced that Wagoneer and Grand Wagoneer production was green lighted yet again. However this time around the plans have changed. Both are to be built on a modified version of the upcoming all-new 2019 Ram 1500 truck platform which will be a traditional body-on-frame platform. In the current Jeep line-up only the Wrangler has a body-on-frame structure. Even though the current Range Rover has a uni-body structure, this doesn’t mean a new Grand Wagoneer couldn’t provide some serious competition. After-all Cadillac’s high-end very luxurious Escalade has a body-on-frame structure, it is a hot seller and a leader in its class. A body-on-frame is inherently stronger and more rugged than uni-body structures. This is why the upcoming Wagoneer and Grand Wagoneer will be true to their roots since the SJ 1963-1983 Wagoneer and SJ 1984-1991 Grand Wagoneer were built on a body-on-frame structure. What remains to be seen is the specifics such as engine choices or suspension design. Jeep probably won’t have a front and rear solid axle setup like the current Wrangler or vintage Wagoneer and Grand Wagoneer. The front will more than likely be an independent setup. The rear may use the 2019 Ram 1500’s solid rear axle and optional air suspension. Or Jeep may surprise us and offer an independent rear suspension. The full-size 2019 Ram 1500 platform based Wagoneer and Grand Wagoneer will not be available until the 2019 model year at the earliest and more than likely it will debut for the 2020 model year. If production does indeed happen it will be very good news, Jeep will then have in its new vehicle lineup something it’s sorely been missing, a full-size SUV. It’s not beyond the realm of possibility that the Wagoneer and Grand Wagoneer could sell more than 300,000 units per year combined. Especially since the Wagoneer would probably have a price tag similar to a Chevrolet Tahoe while the Grand Wagoneer would be priced in Cadillac Escalade territory. It is expected that both the Wagoneer and Grand Wagoneer will have three rows of seats which the currently Jeep lineup is lacking. SUV fans have a lot to look forward to with the upcoming release of the Wagoneer and Grand Wagoneer. The only roadblock to the release becoming a reality is FCA. Let’s hope FCA sticks to its latest game plan and finally gives SUV customers the full-size Wagoneer and Grand Wagoneer they deserve.